Free Shipping On Orders Over $75.00! You’re running late to work and forgot to grab your daily morning cup of green tea. That’s when you realize you’re in for a day of stress. Relax; we have your back... and taste buds. 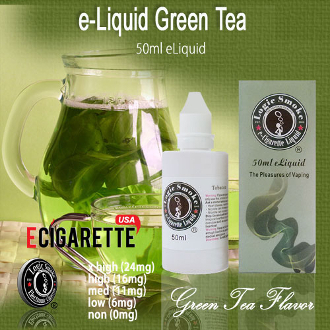 Try our Logic Smoke Green Tea e liquid and become soothed with its comforting, fresh, and botanical essence. Warning: The sale of Tobacco products or electronic smoking devices to persons under 21 is prohibited. Nicotine is an addictive substance. This product has not been approved by the U.S. FDA as a cessation device and therefore should not be used to quit smoking. This product is not intended to diagnose, treat, cure or mitigate any disease or medical condition. Do not use this product if you are under the legal age of smoking or if you are sensitive to nicotine or inhalants. Do not use this product if you have or if you are at risk of having any respiratory conditions, heart disease, high blood pressure or diabetes. Consult your doctor before use if you have any medical conditions. Do not use this product if you are pregnant or nursing. Discontinue use of this product immediately if you experience symptoms such as nausea, dizziness, a weak or rapid heartbeat, vomiting, diarrhea or any other negative physical symptom . If any of the aforementioned symptoms occur, seek medical attention immediately. The electronic cigarette has never been tested or proved to be a cessation device and is not sold or marketed as such. California Prop 56 tax on your products has not been paid for vapor products purchased through this website. Consumers, retailers and distributors in California are responsible for paying the tax directly to the state. Copyright © 2008-2019 Store.E-Cigarette-USA.Com. All rights reserved.